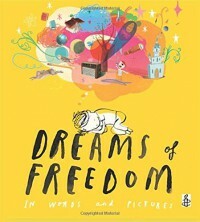 Put together by Amnesty International, DREAMS OF FREEDOM is a picture book filled with beautiful quotes from some of our biggest champions of freedom today and from history. Quotes from Nelson Mandela, Anne Frank, and the Dalai Lama are illustrated by artists like Chris Riddell, Peter Sis, and Mordicai Gerstein. The final pages of the book include thumbnails of all the illustrated quotes along with biographies of both the freedom champion as well as the artist. The beautiful cover is was created by the adorable Oliver Jeffers.